I like how this very common and hardy camellia brings some life to a concrete patio in a Nakano back street. I wonder who placed it there and keeps it well pruned. I can easily imagine a jungle growing between these older commercial buildings, a living food alley with scent and maybe a small creek bed. As it is now, this space between buildings functions as a giant chute for capturing rainwater, which then travels many kilometers and must be processed, alongside sewage, before being released into Tokyo Bay. At least someone working or living there is decorating and enjoying the space. Between the new Miyashita park and Shibuya station, I came across this lovely alley called Nonbei Yokocho, full of tiny bars. Maybe because it’s next to the train tracks, a marginal urban space, this collection of old houses built before or just after the war have survived. I love the weeping willows, the lanterns, and the reminder of Shibuya’s earlier incarnations. Small green spaces in Nihonbashi include the Kabuto shrine and anonymous wall gardens. In addition to a few historic corporate and government landscapes, Nihonbashi also has small shrines and anonymous micro-gardens. Canada’s Discovery History program filmed me talking about these locations. By accident, I stumbled upon a small Shinto shrine called Kabuto. It stands between a building covered in scaffolding and multiple elevated freeways just east of Edobashi bridge. It’s also across the street from the Bubble-era Tokyo Stock Exchange. Just behind it is the river. Kabuto means samurai helmet. The shrine lends its name to the surrounding area. At the entrance are simple wood doors with the kanji for “kabuto” etched. The shrine seems very well maintained, and I wonder if those responsible for the shrine are the current business neighbors or descendants of generations of shrine keepers. I wonder, too, if the shrine used to be larger and better connected to the river. Now it seems almost swallowed up by the man-made environment on three side and from above. It’s interesting that while the Tokyo Station area is full of new towers and multinational corporations, there are also still some small alleys and low buildings that provide a glimpse of the past. I found this curious sidewalk garden outside a five-story building that houses a reflexology clinic, a ramen shop, accountants, and probably a residence on top. Here’s the list of tenants and the old entrance door. The garden is simple, well-cared for, and a cheerful sight in a densely packed area. Construction sites in Japan, unlike in the United States, are almost always concealed behind shiny white walls. Recently, I have noticed more and more of these temporary walls being decorated with plants. Above, three simple flower pots seem like a small an and informal gesture. Below, ivy is built into the wall itself. Somehow, given the humbleness of the plant material and scale, the less designed plants seem more generous and heart-felt. What do you think? The first photo is from a development called Nakano Twin Mark Towers. A short while after taking the photo, I noticed a hand-made sign on the back alley complaining about its massive scale: a residential tower that will be 29 stories high, at least twice as high as any neighboring building on the south side of the station. I am surprised by its height, and also wonder whether the developers will succeed in finding such a luxurious clientele in this rather humble residential area. Below is a developer’s image from the website. No space for fruit tree? Check this out! So many city dwellers think they have no space to grow anything. Recently I posted photos of a persimmon tree near my apartment that is three stories tall and full of fruit. I went back to take a shot of its trunk. Actually, it turns out that there are two trees growing in a space no bigger than the depth of an air conditioning unit. This small space provides sufficient soil to produce hundreds of fruit each year. There’s even room for ten potted plants spilling onto the street, a broom, and some ladders. The ability to create massive greenery and even food in such limited space always amazes me. Update: A reader asked me to provide more context images for these persimmons growing in such a small spot. You can see below that they are growing in a tiny lane the width of one car, and that they reach out from their narrow bases to provide a tall canopy between the buildings. And there’s a third tree of the same size extending through the neighbor’s front cinderblock wall. 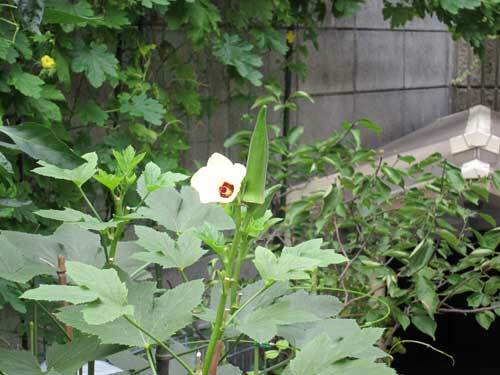 This is the second okra plant I have spotted along the small street leading from my apartment to the JR station. I was impressed with how beautiful its flower is. In the background is a climbing bitter melon vine, and a dog house. The “yard” is paved, so all the plants are in pots. 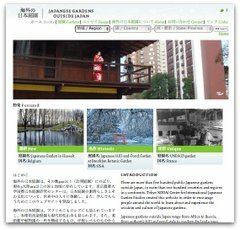 On a drizzly day last week, I met an English landscape architect and her architect husband at Canal Cafe on the Soto-bori moat (外濠) at Iidabashi station. I often pass this moat riding the Chuo and Sobu JR trains, but it was lovely to have a meeting alongside the water. The birds seemed happy in the light rain. (UPDATE: The birds are cormorants, or in Japanese u (鵜). They are fish-eaters). We had a long conversation about conservation agriculture and energy efficient, low-income housing. After enjoying the moat, we took a walk through Kagurazaka and explored its many alleys. I love this neighborhood, and it’s fun to see this historic entertainment district during the day. I love how inward focused the bars and restaurants are, with straw blinds and plants preserving privacy for their customers. This five or ten year old residential mid-rise residential building is surrounded on two sides by hardscaped alleys that provide fire access. This design intentionally creates dead space since the developers chose not to allow pedestrian traffic. Nor did they create any amenity that would attract residents. Perhaps it keeps the apartments quieter, but this space is effectively dead for the public and even the residents. This is a larger scale version of my previous post about dead space featuring fenced-in concrete triangles created to prevent bike parking near a Metro entrance and on a walking path, and excess pavement between houses. In a small Ginza alley, near Ginza Farm, I spotted this mini-watermelon growing in a pot outside a restaurant. What’s most delightful is that the gardener has carefully placed a wooden stand for support. I recently returned to Tokyo from a trip to the US that included a formal meeting with my fellowship sponsor and visits to San Francisco, Los Angeles, Washington DC, and New York. In the US, urban ecology initiatives seem particularly strong at the municipal government and individual levels. In the photo above, I spotted an amazing formal garden extending on one side of second floor apartment. Perhaps the plants are kept small to preserve light and views from inside.